Happy birthday Janell Cannon (Stellaluna). It’s the birth date of Gyo Fujikawa (1908–1998) Babies, Baby Animals. What has become the world’s largest circulated English daily newspaper was founded on this day in 1838. It was The Bombay Times and Journal of Commerce, now The Times of India. Read Landry News by Andrew Clements and illustrated by Brian Selznick. On November 3, 1938, Bette Bao was born in Shanghai, China. By the age of eight she came to the United States with her father and mother and one sister. When Mao Zedong and his Communist party won the Chinese civil war, the Boas were stranded in America. Bette’s youngest sister Sansan had been left behind with relatives. The family struggled to get her out of China, a process that took over a decade. In 1964 Bette Bao Lord published her first book, Eighth Moon: The True Story of a Young Girl’s Life in Communist China, the saga of her sister Sansan. Twenty years later, Bette Bao Lord turned to her own childhood, that of a Chinese immigrant educated in American schools, and crafted one of our best autobiographical novels for children, In the Year of the Boar and Jackie Robinson. The book began as a magazine article; but then Bao Lord decided to change the perspective of her story, to tell it from a child’s point of view. In 1947, Chinese-born Bandit Wong, age ten, must shift from being a pampered child in a very affluent family to an American immigrant, struggling to fit into Brooklyn P.S. 8. Her family still observes their Chinese customs, while she tries to understand the new American ones. As Bandit struggles with English, she finally realizes that the best way to connect with these strange Americans may well be through the sport of baseball—more exactly, with her classmates’ love of the Brooklyn Dodgers. And though Bandit (now renamed Shirley Temple Wong) has some rough times, in the end she triumphs and demonstrates that America can truly be a fabulous country for immigrants. Expressively illustrated by Caldecott Winner Marc Simont, the book works both as a read-aloud and read-alone for second- through fourth-graders. This honest but funny account shows how someone born in another country becomes assimilated into the United States. If you happen to be a baseball fan—or just a Dodgers fan—it captures how a community can be brought together because of a group of players. Even if those players are called “the bums”! Although published in 1984, the book addresses issues as contemporary as today’s headlines. Bette Bao Lord has devoted her life to writing novels for adults like Spring Moon and engaging in ambassadorial work around the world. In the Year of the Boar and Jackie Robinson gave the children of this country a portrait of one very engaging child’s process of becoming an American. Thank you Mrs. Lord—and happy birthday. The third morning, it rained. 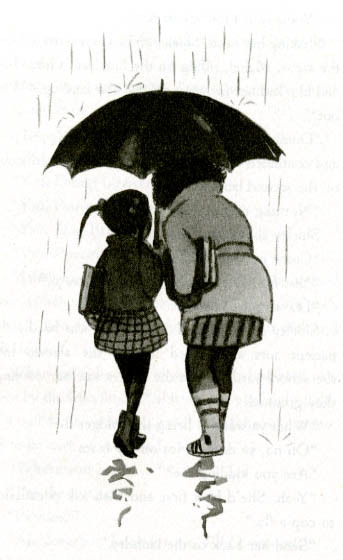 As Shirley opened her umbrella, she saw Mabel standing across the street underneath a tree, getting soaked. Oh no! The war was not over. Shirley started to run. But the tallest and the strongest and the scariest girl in all of the fifth grade was also the fastest, and easily caught up. “Hey, you okay?” Mabel’s voice actually seemed to be rather friendly. The rainwater dripping down her black face looked like tears. Shirley nodded, and hoisted the umbrella to cover Mabel’s head. When school was over, the skies had cleared and the walks were dry. Only the leaves, shined to a tender green, gave a clue to the shower that had passed over Brooklyn. Originally posted November 3, 2010. Updated for . Happy birthday!!! I really do appreciate this website. I am a researcher and a homeschooling mum in Australia. I hope it lives long and prospers. Our family has been homeschooling for 13 years with Sonlight Curriculum. I loved this book when my oldest kids read it; loved it when my second group read it and I am looking forward to reading it again this year! Great book! Thank you so much for highlighting this book. I had sadly forgotten about it and am grateful that I was reminded of it and its relevance today. As you said, despite its publication date, this book is still very pertinent and important. I look forward to rereading it and recommending it to kids! I can’t believe I’ve put off reading this book and will wait no longer. As a young teen I was a rabid Dodger fan, who so admired Jackie Robinson that I cried when the radio announcer said that he was up at bat for he stood for much more than integration of the major leagues. He stood for triumph over all the pain, shame, adolescents like me felt, and he showed us how to confront all this with grace and dignity. And having become part Chinese with my son’s marriage to a Chinese women, not an immigrant, but one Chinese and proud of it. She, my son, and my beautiful Littlest Grandson, Sullivan Wong Rockwell (aka Huang Luo Yi) live in China. Thanks for writing this story, Betty, and thanks Anita for reminding me that I must read it. Must, must must! Anne: Yes, a fabulous book to read and share when you can. Such an important story. I look forward to reading and discovering new books on our daily posts. Thanks for sharing your love of children’s literature.